Designing a park in the desert presented a series of challenges, the most serious of which was how to protect visitors from the hot desert sun. Offering a place for relaxation and leisure, the park also needed to be energy efficient. The existing public space evoked a European park, covering the desert with a blanket of grass. 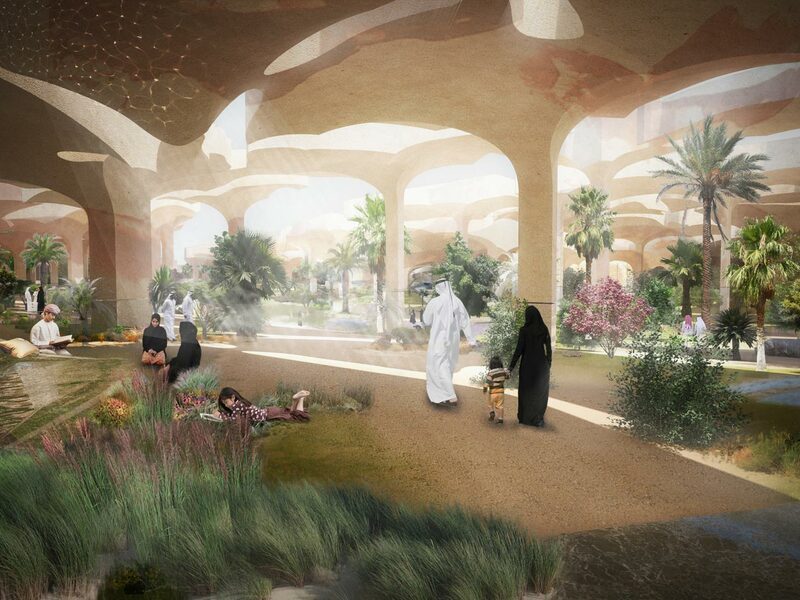 The idea for the park’s design developed in response to these challenges, as a way of celebrating the beauty of the desert and its distinct forms. 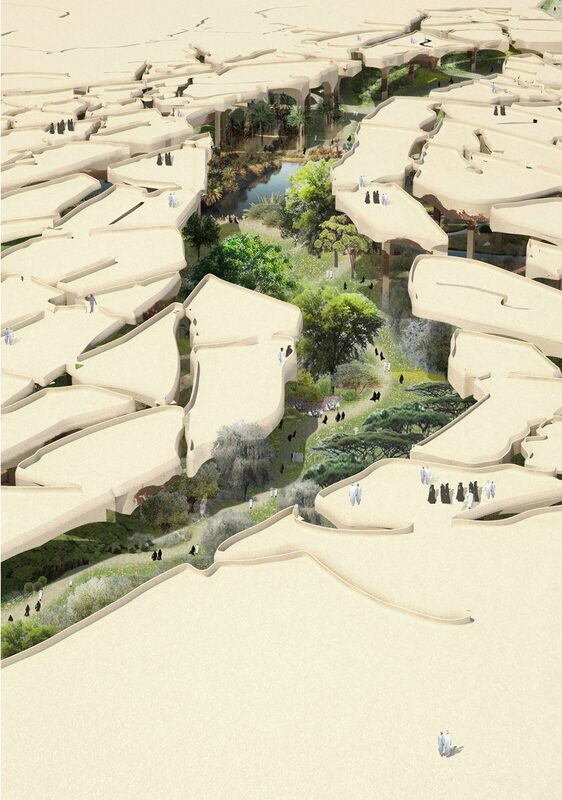 Instead of denying the desert, Heatherwick Studio decided to be inspired by it. Experimenting with the idea of a structure based on the fractured desert crust, a scheme revealing partially shaded planted spaces below a concrete surface was developed. The lower park, partially shaded with 20m high roof plates, is conceived as a place for families to gather and picnic, as well as a place for learning and festivals. Visitors will find cafés, play spaces, a library, pools and streams, as well as date palms and community vegetable gardens. By creating partial shade for the planting, the canopy aims to reduce the amount of water lost to evaporation, and so will improve the park’s efficiency and sustainability. 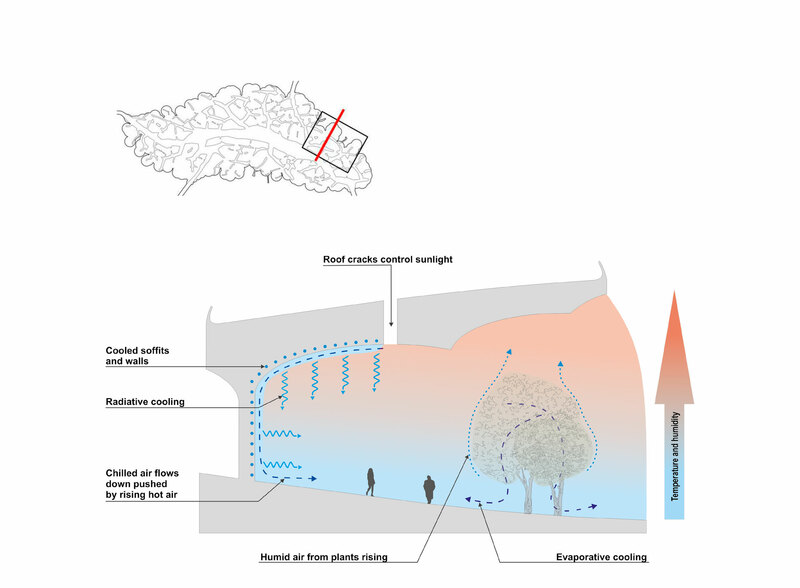 To further augment comfort in the lower park and create a truly unique park experience, Transsolar analysed a series of climate-appropriate comfort measures using dynamic thermal simulation and CFD, ranging from passive to active measures. The resulting solution was radiant cooling which would integrate seamlessly with the strong architectural narrative.To balance the demand for comfort and energy consumption, the team selected comfort islands or areas where comfort measures would be most critical. Each comfort island was then carefully considered and adjusted to maximize its comfort potential on an hourly and monthly basis. Energy demand from the active cooling system is offset with photovoltaics located on-site. Another critical aspect of the project was the contradiction between needing more sunlight for plants and less sunlight for visitors; this was navigated with Transsolar’s daylight analysis. Lastly, for the front-of-house spaces, Transsolar provided Estidama (Abu Dhabi green building rating system), energy and daylighting recommendations.